With that object in view, please allow yourself to consider this: Who would YOU die for? Your neighbor? The paper boy? A stranger? Aside from very brave soldiers, police officers, and firemen, laying down one’s life for another person seems to be a bridge too far for most people. Add to that the torture angle – not only must you die, but prior to that you will be whipped, publicly humiliated, beaten, stripped naked – before cruel men hammer huge spikes into your wrists and feet and suspend you from these horrible wounds until you die an agonizingly slow death. Even a very courageous person would likely blanch at the thought, while others are under the bed just thinking about it. Would you endure such abuse even for a very good friend? Your husband or wife? Certainly, some have endured torture and even death for God or country, or familial love, but such self-sacrifice is rare enough to be quite remarkable. 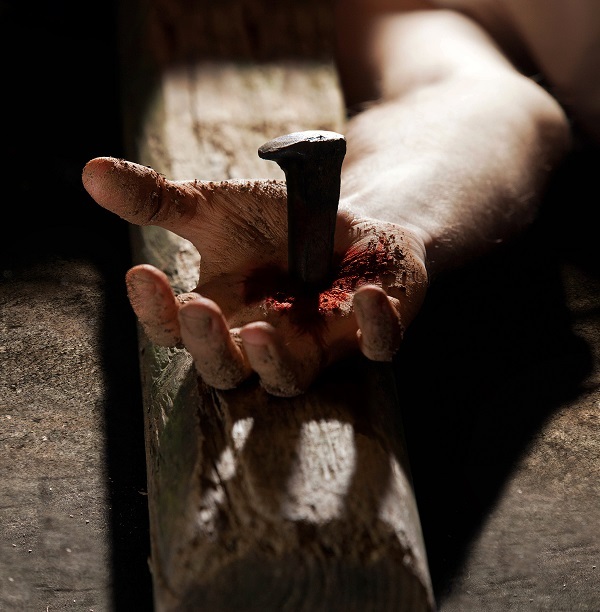 We were helpless, ungodly sinners when Christ chose to give His life on our behalf. Not mere “strangers;” we were ENEMIES of God. Enemies?? Take a look around you. Ask yourself why so many of those who say they “disbelieve” in the God of the Bible are not neutral towards Him at all, but actively detest Him! Did you ever wonder why that is? Why would a person HATE someone he or she does not even believe exists? According to the Bible, even if one has no emotion of animus toward God, we all are born enemies of God just by being part of the rebellious race of mankind. But, Jesus Christ, who loves us, bore the agony of the cross for our reconciliation. Such an act of gracious heroism is rare indeed and is confounding in our vengeance-oriented society. We human beings often don’t just get mad at those who hurt or oppose us: we get even. And self-sacrifice is looked upon almost as a defect. But, what of the Father? How did He show His love for us? Think about this: You’d go up on that cross for your son or daughter. For whom would you GIVE your child whom you love so much? On whose behalf would I send my daughter to her death? Whose life and security would I purchase with the well-being of my own son? NO ONE’S. Yet, so great is the Father’s love for me and you friend, He gave His only Son. From a parent’s eye view, an unbelievable sacrifice. I don’t write this primarily to those who know God’s love and already have become convinced by their relationship to Him that He loves and cares for them. I speak to those who are vastly unsure of God’s love, who have been in cults or abusive churches, or who are completely out in the cold. The only emotion they feel from God is anger or disapproval, and the emotion they have for God is FEAR. I don’t say there is no such thing as a healthy fear of the Lord, one that brings us to a place of recognizing our need for forgiveness and a savior. But, if your fear leads to endless striving and not to conversion or, if conversion does not ease your fears, you’ve gotten the wrong message about God’s love and grace. Some have missed the message of grace because religious traditions have gotten in the way. Yes, they have been taught about the sacrifice of Christ, but the simplicity of the gospel has been obscured by add-ons, such as purgatory, penance, law keeping, or perhaps they’re riding the “good works” rollercoaster.